The current case before the U.S. Supreme Court involving Hobby Lobby's claim that the owners' religious beliefs trumps federal law about providing comprehensive health insurance to cover ALL women’s needs (read, contraceptives) raises some ugly questions and even uglier opportunities in America. If the court rules in favor of Hobby Lobby, a precedent is set for business to discriminate in any manner and base it on their religious beliefs. Image that a business is started in Mississippi or Alabama and the owner says that his religion finds black people subservient and therefore he doesn’t have to hire them. In fact he can exclude them from even being considered based on his religion and their race. Fair? Of course not. And not equal under the law. But the court could make it so with this ruling. Here's another case. Let's say I decide that women is inferior to men and base it on verses in the Bible. It is part of my religious understandings and teaching and therefore I can lower a woman's pay; in fact, I can even discriminate against her in any form I wish. The Bible says so to my mind, therefore the government can do nothing about it — if the court rules in favor of Hobby Lobby this would become the law of the land. So you see, this case is about a whole lot more than Obamacare. It covers a whole lot more than contraception, abortion and all the things what have to do with a woman's reproductive cycle that Hobby Lobby doesn't want to cover. (Funny that they didn't mind paying for Viagra for men.) The point is, with the wrong ruling here, the court can open the door to discrimination based solely on a person's religious beliefs. Unheard of a few years ago, but we have swung so far back to the right as to allow a vocal minority in our country to create a religious oligarchy that drives our courts and our laws. It doesn't matter which side of contraception you stand on...this case is wrong for America because it opens the door for allowing religion to trump the law of the land. It opens the door for discrimination based solely on what a person says they believe. I for one don’t want to see more government in our hair, but in this case, the law says if you offer insurance to a employees, you can't discriminate against a class of those employees based on their race, creed or gender. Besides, what a woman and her doctor agree is the best path for her health, is really none of the company's business. None. They are merely providing the insurance for health coverage, not the control of an employee's life. I hope the court gets this one right. They missed terribly in Citizen's United. This would be equally dangerous to our democracy and fair play. Citizen's United allowed our democracy to be bought and sold at will. And the Kock brothers' will is to get their way, no matter how much it cost them. They are buying America. And I am not talking about the land. I am talking about the ideal— the vision— the dream. The United States of Kockdom is what we are going to get. And we have it all to blame on the five stooges who sit on the right hand side of the not so supreme court. I think the Kock brothers deserve a voice. But so too does a young woman in Peoria or a man in San Diego. Equal voices, not weighted to cash reserves and bank accounts. One vice. One vote per person. I think a person should be allowed to give to political causes. Let’s say a thousand dollars per year. Tops. No more. That would end this buying of government by the extremely rich. It would give back to America and equal playing field. Influence would not be measured in dollar signs but in yard signs and in neighborhood canvassing and leatherwork along the highways and by ways of this land. Get the vote out if you want your candidates and your ideas to carry the day. But don’t spend trillions on lies and inuendo to force corrupt politics into the system. Thomas Jefferson, Ben Franklin and George Washington would be aghast at the sight of American politics as it is being practiced under citizen United. It is not what the founding fathers had in mind when they drafted a constitution that was bled over with lives of people who believed in one man one vote. Freedom of speech was designed to give everyone a chance to be heard, not the mega wealthy only. It is time America stood up to the Kock brothers and their ilk. Vote. Got to the polls and vote your own conscious. In that way you will have taken millions from billionaires who wish nothing more than to rob you blind. George W. Bush left us a present. The will to say no. As the GOP in congress wag fingers at President Obama for not taking a harder line against Vladimir Putin and his antics, they run up against a bit of their own history that is making it hard for the U.S. to counter the Russian Bear. Here is a legacy of George W. Bush that radical right-wingers haven't thought about. His invasion of Iraq and our subsequent near decade-long battle there has created not only a financial ruin within the Federal budget, but a lack of will for more war and more killing among the American public, normally willing to follow their leaders into conflict. Both Lyndon Johnson and Richard Nixon worried about prolonged wars draining the American will to fight. And they both knew that that very will needed to held in reserve in case we had to face one of the powers from the Eastern Block. They both knew we could not dip too often into the bank and withdraw American support for more war, lest the funds in the bank run dry. I call this the Chicken Little Syndrome. Remember the foolish foul who kept running around shouting, The sky is falling, the sky is falling." He did so for so long and so loudly that soon no one believed him any more. No matter how hard he shouted and how loud he raised his voice nobody took notice. America is in that similar boat today. No matter what the moral outcry from the White House and political leaders are concerning the situation in Russia over the Crimea, we just don't care. We have spent our moral currency on a stupid, trumped-up war in the desert chasing imaginary Weapons of Mass Destruction. It was a war with no concrete reason. A war that cost us thousands and thousands of lives and trillions of dollars. And we, as a people, are not interested in getting into harm's way again anytime soon. Recent polls show that less than 20% of Americans want to get involved with Russia's business. Hell, more than that want to lynch Obama over healthcare. Russia knows this. It is why Putin chose this time to act out in his region of the world. I predict China will do likewise with the island disputes with Japan. And America will sit back and do nothing, because we have no more stomach for fighting in foreign places over things that don't concern us. Don't get me wrong; the people in Crimea and those camped out in the square in Kiev, all have a strong point of view about whom they want to answer to. (Admittedly those to views disagree by 180 degrees...and they both think democracy is on their side.) But Americans see those problems as troubles for Russia. Not ours. We don't want to see American blood poured over this regional mess. So in a strange way, George W is to be thanked for keeping us out of the conflicts popping up around the globe. His ‘attack first, ask questions later’ philosophy has actually turned us to looking inward. We no longer wish to police the world for the sake of every small time king or potentate's survival or overthrow. Feeding our hungry, caring for our ill, building bridges across our own rivers and schools for our children has become more important than foreign affairs. Foreign affairs have cost us our moral shield...recalibrated out moral compass. We gave it up when we invaded a sovereign nation back in 2002, then laid waste to their government and infrastructure. We have no truth and righteousness to stand on. Besides, we are sick and tired of war. Thank you Mr. Bush. In a strange way, you gave America what it needed most. The will to say, "No more war." A truce (for a moment) in the war. My little Sandy, our ferocious Chiweenie, found a nest of baby squirrels that had recently been blown out of a tree in our front yard. Normally Sandy is single-minded in her quest to chase every living squirrel from our premises, but when she found these babies struggling to get up on their feet and figure where they were — where their mother was— she backed off and lay in the grass to watch them. No hair stood on her back. No growling. Just quiet curiosity. One baby squirrel struggled to climb a short rock wall, which surrounds bushes and a pin oak tree. It kept getting partially up the structure, only to fall back into the grasp of gravity and the high winds that swept across North Texas. Sandy inched closer. She nuzzled the young squirrel and pushed it up and over the wall. It was if to say we will face each other another day. But not now — today we are equals and I will help you. The other baby was emerging from the downed nest and was looking for a way out of the situation when this crazy part Dachshund /part Chihuahua animal came over and nuzzled it toward the wall that its sibling had just scaled. The second squirrel needed no assistance in making it over the rocks and into the bushes below. Again Sandy simply watched. Deed done. Later that afternoon Sandy returned to chasing the bushy, tailed varmints around the yard, but these were adults who successfully avoided her short legs and yelping the lodged themselves in branches just above her head and tormented her with chatter and clicks, while raining pecan shells down upon her. She sulked back into the house knowing she would fight another day. As far as Sandy knows, that is why we feed her so well. What she doesn’t know is that we let the pecans from our trees fall to the ground to keep the squirrels around just for her entertainment. It must be how God handles Republicans and Democrats. They are each there for each other’s amusement. The Internet is a wonderful tool of discovery and research. It can also lead to some sad findings. Yesterday I was searching for an old friend to try and reconnect only to discover he had passed away in California. In fact, within the time span of six months I lost four very close friends. Del Threadgill, Jud Griffin, Paul Miller and Larry Corby. All good buds and all gone. In the course of six months life changes drastically. A phone call from a son. A note form an old friend. A middle-of-the-night text from a business associate. And a lone search on the web. And they all lead me to the same bit of information. A part of my past has been buried in Mother Earth. Gone, but certainly not forgotten. Each of these guys held a special bond with me. Each was part of my life at an important and defining time. Threadgill, Griffin and I grew up together in East Texas under the oil derricks of Kilgore. We attended UT at various times together and they were in my first wedding. We had a bond that went way, way back. The “Threader” and I were even roommates for a while in Austin. I learned to play the guitar on Griffin’s Silverstone archtop. Also had my first beer with him. We had a lot of firsts together, I jut can’t remember them all. Same is true with Delmar Ray. Miller lived with me for a year in Austin and became one of the packrats, as we called ourselves. He and I would get close, then drift apart and then get close again. Distance would always separate us and suddenly something in life would lead us back together. We were working on a movie-book deal when his life was taken away on a CA highway. And Corby was one of those people who came along later in life; who inspired me, made me laugh, made me cry and made we want to do new things every day. I propped him up during his divorce and we turned around and offered me the same comfort and strength during mine. My job, my career, my neglect separated us. The miles and the years between us lead me to wonder what he was up to. A Google search brought me to tears. Larry, like the other three musketeers from my life, was gone. And it all happened in a six-month period of time. So my advice to you: reach out and connect with your old friends. They are precious. And you’ll never know when they might not be on that other end of the line when next you call. Life is that unsure and that perplexing. Now is not the time to wag the finger, Mr. President. 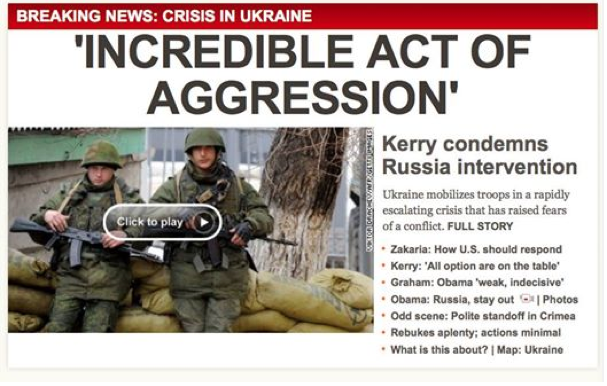 Now I don't want to take side with Russia in this mess in the Crimea, but this headline seems to forget that our own country invaded a non-hostile, non-threatening sovereign country with a preemptive force a few years ago under the W. There are actually Russians living and in danger in the Ukraine. I am not so sure how much in danger Americans were in Iraq prior to our invasion...We have a very short collective memory as Americans and a very warped worldview. Before we point the finger at Putin we need to look in a collective mirror. I am afraid with Iraq and Guantanamo, our national moral compass is a bit off true north. This was the entry that started an entire Sunday's worth of discussion on Facebook. Many people were incensed that I would make a comparison between the W's actions and Putin's. I for one think they are similar. I believe both Presidents invaded sovereign nations. I think both are acts of aggression. but we don't see it that way because we are Americans and our leaders can do wrong. And the others are Russians and can never do right. True, Putin is a bit of an old school KGB thug, but we still have our human rights issues, like the most imprisoned population in the world and that glaring human rights conflict in a place called Guantanamo, Cuba. The idea behind this comment was not that Putin is right. I do not believe he is. I just don't think we have the moral compass any more as a nation to tell other countries what they can and can't do. that is a shame. Plus, I don't think there is a soul outside of Washington who is not a Tea Bagger, who wants to go to war over this. If America wants to police the world, we'd better be ready to pay for it— in dollars and in moral currency, as well. Let's keep our nose and troops out of the Ukrainian mess. Saber rattling. That is what they call it when a despot moves his troops around to scare neighboring countries and states into believing he means business on such and such an issue. It also is usually an empty gesture. Putin his rattling his sabers and so, too, is Obama. Everyone knows the last thing America wants right now is another armed conflict. Our economy couldn't stand it nor could our national desire for more blood on our hands. In fact, a recent poll showed that more Americans favored pulling our troops out of danger zones than advancing the numbers. War is not a good policy; especially for a country who has no vested interest in the outcome of that conflict. And the Crimea is of no concern to Joe and Ester in Kansas. They are much more concerned about getting this season's planting in ground and avoiding another drought. So we strut around voicing our displeasure about the Russians moving troops to protect a southern state of some country that has a lot of Russians living there. The last thing Putin wants is an armed conflict in the Ukraine. He is smart enough to know he can’t win in the long run. He, like us, can remember Afghanistan. He might overpower the locals, but soon they would rot the infrastructure of society from within and the Russians would have an even bigger mess on their hands. So, maybe this time it is best that the U.S. keep out of this. Shut up in fact. Say nothing. go about our business of drawing down the troops abroad and working on finding them jobs back here at home. In fact that would be a good foreign policy for us. Let us first look at home to make it stronger. Let the world care for its own. Sorry. We're busy. We've got problems of our own and we plan to fix them first.